I'm not afraid to admit that I am ridiculously attached to my earbuds. I seriously can't go anywhere without them. I always think to myself - self, do I really need these? And the answer is always YES! What if you are stuck waiting for someone and you get bored? What if you are in a car with people and want to drown them out? Or even worse, what if you are on the bus or subway? Earbuds are the perfect way to be anti-social without being rude. Think about it. When you see someone sitting on a bus or at a bus stop, or waiting near a restaurant or mall and you think about approaching them, don't the earbuds throw you off? You see someone with earbuds and it sends a signal that they shouldn't be approached. I know I do it all the time. When I take the subway or go to the gym, the earbuds stay in. Yeah, I enjoy the music, but even better is drowning out the people around me or putting up a barrier between myself and the wierdos out there! I've even been known to putting in earbuds and not listening anything just to avoid talking to people. It's the perfect excuse. Earbuds also help me stay productive. I'm one of those people who doesn't like the quiet. It's not that I'm afraid of it, but if it gets too quiet, I find myself looking for stimulation. I find that more and more people are like this, maybe because there is so much more out there than ever before and we are getting used to this fast paced world... maybe it's just because my generation just wants to rebel but who knows. All I know is that I'm grateful for my earbuds come the 4pm lull at work. I know I'm not the only one who feels this way about my earbuds. When you walk in to the electronics department of Target, you see how many choices there are! There are earbuds of all shapes, sizes, colors, and price points. You need to decide if you want the in ear earbuds, headphones, big ones, small ones, huge ones... There are an endless amount of options. 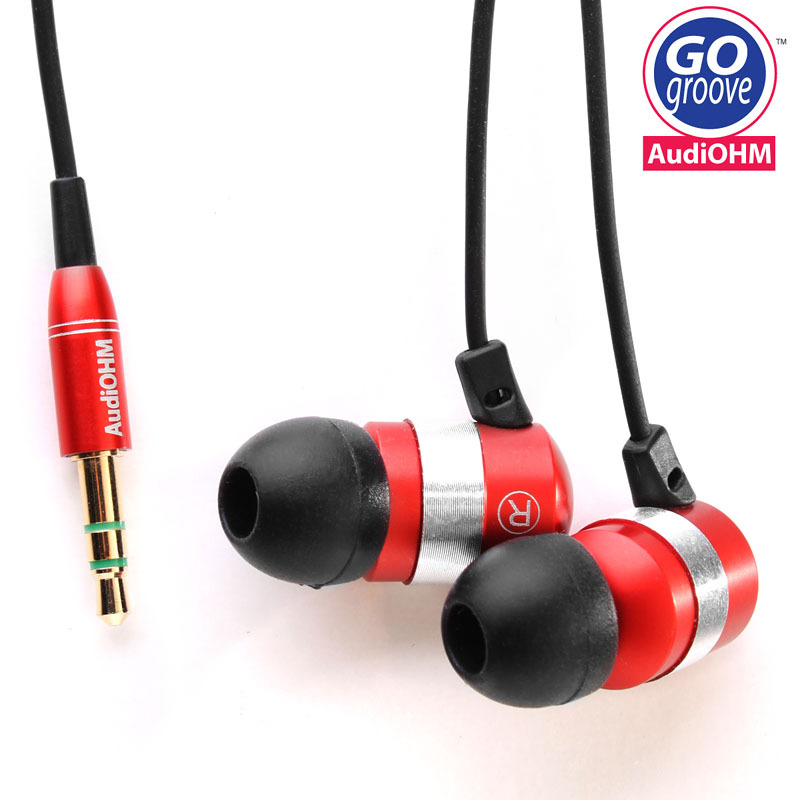 I love my audiOHM earbuds from Accessory Genie. Thank goodness I found an affordable pair of earbuds that fit comfortably in my ears and have excellent sound quality. Before I got them, I thought my Apple issued earbuds were just fine, but these make those other ones look like a joke. They come in 3 colors, a dark green, bright blue, and red. I have the red ones and they're awesome. They also come with 4 sizes of silicon ear pieces so I can customize them to fit my ears perfectly. Also makes sharing a little better if you're like me and are grossed out by other people's earwax. I would recommend these to anyone in need of a good pair of earbuds that doesn't want to spend a lot just for the brand name!